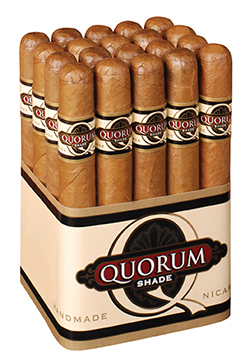 J.C. Newman Cigar Co. introduces a welcome addition to their very popular Quorum line of bundled cigars ~ the Quorum Shade. If you've smoked the original Quorum, you know the tasty mild- to medium-bodied flavor and great price of these quality handmade cigars also make them the perfect 'every day' smoke. As the Quorum brand grew in popularity, J.C. Newman received many requests for a milder version of the original Quorum blend, and Quorum Shade was born. Featuring a mild, flavorful Connecticut Shade wrapper and Nicaraguan binder/filler, the handmade Quorum Shade cigar is the one you'll grab on the way out to play golf, mow the lawn, or barbeque because it's smooth, enjoyable, and priced to smoke at the drop of a hat.